If you want to share items in your File Storage with friends or family, you can create a share for these items. 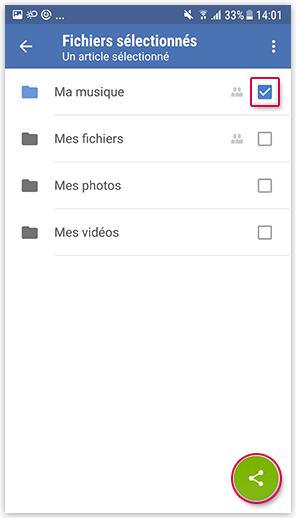 In the share settings, it is possible to give other users extended rights to edit and delete in the shared folder. The password, the edit and view rights and the share duration can be modified anytime. If you share a folder, the recipients of the share link can access the folder in your File Storage and download the items. You can protect the share with a password. Choose the folder that you want to share by checking the box next to the folder name. You shared the folder. More information on the share is displayed. You can send the share link directly via e-mail if you tap Send via e-mail. Tap the gearwheel icon if you want to modify more settings. 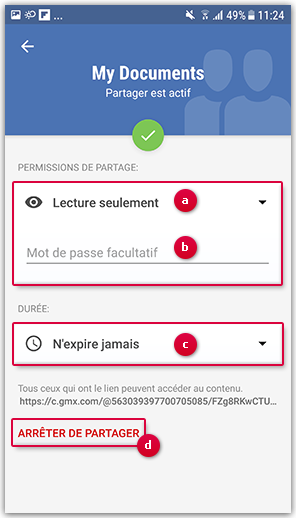 You can now set the access rights (a) and protect the share with a password (b). You can also set the share duration (c) or end the share (d). Your settings are saved automatically. To close the settings, tap the back symbol on the upper left.